In England this book is sold under the title of “Expository Preaching,” but if you get it online, I would go for the American title so you are sure to get the 2nd edition. This is Robinson’s highly revered “how to” preaching textbook. He presents a ten-stage process of sermon preparation in his typically precise style. No word is wasted. In many respects numerous other books on preaching are building on this one, trying to offer some clarification or slight adjustment. That is certainly not true of all, but of many. The emphasis throughout is on preaching a thoroughly Biblical message, through effective communication, in a way that is entirely relevant to the specific contemporary audience. The “Big Idea” is central to the philosophy and the procedure of preaching. So the ten steps move from understanding the text to the point of an accurate and clearly defined exegetical idea, through the process of developing the homiletical idea with clear purpose, to the practical matters of sermon shape and effective content. Although there are other books that deal in detail with issues of delivery, Robinson’s brief section on delivery is helpfully succinct. I think it is fair to say that anyone interested in the subject of preaching should have this book. 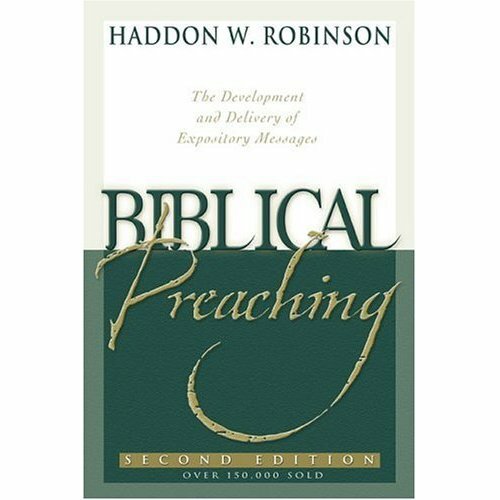 Robinson’s combination of Biblical commitment, expertise in communication theory, and renown as a teacher of preaching, effectively blend to make this a very effective book. It seems wrong to review another book before this one!